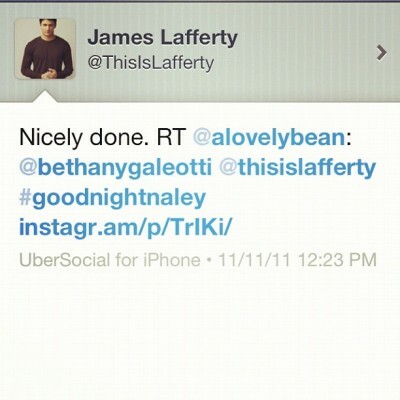 not to mention the fact that Bethany Joy also retweeted the photo later that day. 11/11/11. 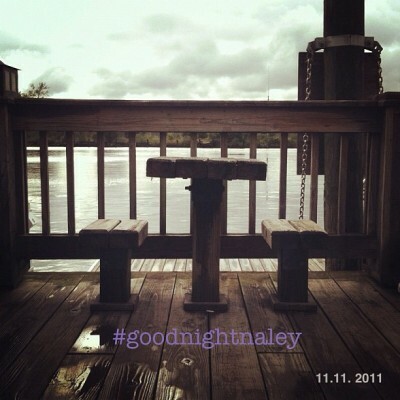 the very last day of Naley. ever. it makes me teary-eyed just thinking of this. but, James tweeted me. and that is how I will remember this day. but seriously one tree hill is completely controlling my emotions lately. it can't eeeeeeeeennnnnnndddddd!!! I don't get it.... Isn't there one more season of OTH that hasn't started yet? What happened on 11/11/11?? Yes, there is another season, season 9. Technically it's only a half season, it starts in January. But filming is completely wrapping on Wednesday for good. As in for FOREVER! So the past two weeks have been filled with unbelievably sad and sappy tweets from the cast as they wrap up filming. 11/11/11 was James' final day of filming. THE LAST NALEY SCENE EVER. You can imagine my breaking heart, yes? where is the location of the photo u sent to bethany & james? i would like to visit there.